Equipment) section of the Home Healthcare Industry (MEDTRADE). 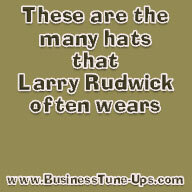 In 1977, Larry Rudwick co-founded a business that would become "Your BEST Source for Wheelchair Parts and Accessories" for the entire USA. But it didn't happen at first. In fact, Production Research Corporation was originally created to help inventors and manufacturers create prototypes of new potential products. So how did this business become very successful, the #1 wheelchair replacement parts supplier, and later sold to its main competitor - Invacare - a big public company? • SUMMARY: Here are the secrets to our success, some advice on starting, and managing a business, and a summary and list of key events and factors that ultimately led to this business becoming very successful. It was not a simple nor quick process. But I can definitely say: Had we known then what we know now, we could have become even more successful and done so more quickly. After all, hindsight IS 20/20! 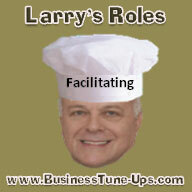 It's 2012 now, but the same business principles that worked then can apply to almost any organization today. • DEFINITION OF BUSINESS SUCCESS: Keep in mind, as you read through this, that everyone's definition of business success varies to some degree. But speaking as a business owner and serial entrepreneur, I believe a successful business: 1) provides products and/or services which are helpful and cost-effective to its users, 2) provides a healthy work environment for its employees to grow, through training and delegating duties 3) treats its suppliers, customers and other organizations it deals with, professionally and fairly, 4) ultimately becomes financially profitable and sustainable, and 5) develops succession plans, to pass on or sell to family members, employees, or by getting acquired through an M and A (merger and acquistion), either by going public or getting acquired by another business entity. • INITIAL KNOWLEDGE: The co-founders had significant knowledge in designing and manufacturing custom bicycles. We started out with two contracts to design and build prototypes of new types of electric-assisted and recumbent bicycles. Without this initial knowledge and experience, it is very doubtful this business would have succeeded the way it did. • IDEA FROM A FRIEND: The co-founders had a mutual friend who previously had a spinal cord injury. The friend suggested we make high-performance wheelchair hubs, the center part of a spoked wheel. Because we happened to have made some high-performance bicycle hubs, after making appropriate modifications, we advertised this first product in a wheelchair sports magazine Sports N Spokes, as well as Homecare Magazine and started selling them to wheelchair athletes. This launched our new business: initially to make custom high-performance parts to help people with disabilities! • MEETING AND LISTENING TO OUR CUSTOMERS: Initially we knew nothing about wheelchair parts. So, we attended wheelchair sports events and developed good relationships with some of the best athletes. They gave us good ideas for additional wheelchair parts, tested our prototypes and, after we produced new products, spread the word to their friends. We learned to apply the modern bicycle technology to wheelchairs, which were about 30 years "behind the times" (back in the 1970s). • FINANCIAL DIFFICULTIES: Designing new products and having customers appreciate you can feel very satisfying, but for relatively new businesses, there's usually not enough profitable business to pay all the bills. And ours was no exception. Owners' salaries were eliminated and shortly thereafter, one of the co-founders decided to resign. 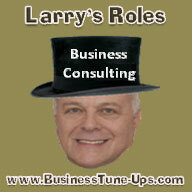 A new partner had a business degree and was certified in accounting; systems were set up to better track our cashflow. Inventory gradually got under control so we knew what we had and we didn't order what we didn't need. 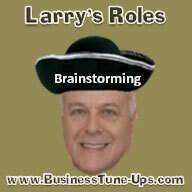 • SALES, MARKETING AND OTHER CHALLENGES: Wearing lots of hats was quite "wearing". 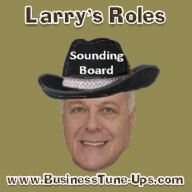 During years 2-4, Larry was responsible for designing products, manufacturing (supervising the shop), ordering some of the inventory, doing all of the sales and most of the marketing. 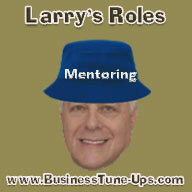 After our computer system was installed, Larry spent significant time designing additional sales and marketing software that was used by his sales team. There was never enough time to do everything that was on THE LIST, but keeping things in priority and perspective was essential. • COMPETITION: We were primarily competing with the major wheelchair manufacturers: Everest & Jennings (E&J), Invacare (Rolls), Motion Designs (Quickie), and Sunrise Medical. Our product line grew to where we had more wheelchair parts available than all the manufacturers put together. We could usually ship an order the same or next day. And we were competing for business for organizations as large as Abbey Medical, Medical Equipment Distributors (The MED Group), Medline, Van G. Miller & Associates (The VGM Group), and the Veterans Administration (the VA). • MANAGEMENT CHALLENGES: As sales grew, we hired more people to help, including our first full-time salesman. But managing our growing staff became the real challenge. 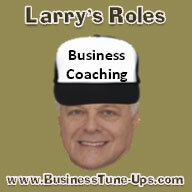 So we hired an experienced management consultant/executive coach, who worked with us typically one day a week. When he started, he knew NOTHING about wheelchair parts; a year and a half later, he STILL knew nothing about wheelchair parts, but he did teach us more about management which gave us more confidence to manage our business. We were now on our way to success, becoming profitable! • BANKING RELATIONSHIPS: We were fortunate to be referred to a very good CPA firm that worked well with us. They helped guide us on the financial side and introduced us to banks that were willing to offer us significant credit lines. This allowed us to purchase equipment that kept our costs down, and stock significant inventory of wheelchair parts so we could ship most of our orders within a day or two, beating our competition. • USING TECHNOLOGY CREATIVELY: People are typically your biggest cost, so you need to make sure they have the tools to function very effectively. We found that spending significant time and resources on acquiring great software, and then making some modifications to it, greatly helped our sales, customer service and production staff to really know what was going on and what they needed to do from minute to minute. We could often anticipate what our customers needed by looking at past ordering patterns. Our customers really felt we were on THEIR team. • MANUFACTURING SYSTEMS: Our business did more operations in-house than many of the large wheelchair manufacturers, such as plastic injection molding, metal stamping, tube bending, welding, vinyl coating, upholstery fabrication, general assembly, and much more. This allowed us to make products virtually custom when necessary and ship them out same day if a patient needed them in order to be released from the hospital. Because of this flexibility, we could charge sizable rush fees that helped to add to our revenue and bottom line. • VAST PRODUCT LINE OF WHEELCHAIR PARTS: Our first product was a high-performance wheelchair hub, the center part of a spoked wheel. Then we learned people wanted complete wheels, so we starting making handrims (the ring that pushes the wheel), wheelchair tires, and offered custom wheels to order. Over time, our product line grew and grew, adding seat and back upholstery, bearings, caster wheels and forks, footplates, seat belts, positioning devices, rehab equipment, tires and tubes, and more. In fact, all of the common parts for all of the common wheelchairs, in more sizes, styles, tread patterns, than all of the wheelchair manufacturers put together. With the fastest shipping time in the industry, virtually all of the DME Medical Supply stores and wheelchair repair companies bought from us. • GRAPHICS DEPARTMENT: We purchased one of the first Macintosh computers in 1988 and designed our own brochures and catalogs IN-HOUSE. We ultimately had many more wheelchair parts and accessories for the replacement market than ALL of the wheelchair manufacturers put together. By having one or two full-time graphic designers, we kept producing frequent mailers to keep our thousands of customers aware of our new products and "specials". One year we even won first place for the design of our catalog, beating IBM! • GREAT MANAGEMENT TEAM AND STAFF: As time went on, the business got stronger and stronger. Having a computer system that was very well adapted to our needs allowed people to know what they needed to do, and often "assisted them" in doing it! Every employee had an incentive plan where they could earn quarterly bonuses based on both company performance and their individual performance. This, of course, included our 20 in-house sales and customer service staff as well. Because we had 19 years of continual growth AND our practice was to grow from within, our staff had many opportunities to advance and earn raises that far exceeded the cost of living. We almost always hired new staff at entry-level positions, which gave all of our staff opportunities to keep learning and growing with the company. • BUSINESS GOT ACQUIRED: In 1996, PRC was acquired by the #1 wheelchair manufacturer - Invacare - and became The Aftermarket Group (TAG). Production Research Corporation (PRC) had grown to where we supplied almost 50% of the replacement wheelchair parts market in the US and had a great reputation among our customers, too. We learned about mergers and acquisitions, and then hired experts to handle crucial negotiations and contracts. It was well worth the cost. ....4) Be open to ideas from ANYONE, whether it is a customer, a supplier, your lowest paid employee, or an experienced business coach or consultant. Would you like to benefit from this experience and the experience of others, sometimes gained by business coaching? If so, 1) read the bottom of this page, 2) see our homepage, and 3) sign up for our free monthly newsletter. By subscribing below, you will also gain full, free access to my complete video on making great changes happen - a $99+ value.